Rampsbeck Country House Hotel is an early eighteenth century country house, set in 18 acres of park and garden on the shore of Lake Ullswater. 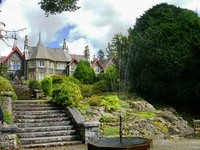 The Hotel is approached down a long drive with views of Lake Ullswater. The gardens have been formally laid out and are divided by yew hedges and access to the different levels is by sets of sandstone steps. 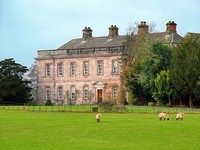 On the first level is the bar lawn with seating and views over the garden to the Lake and fells. On the next level is the sundial lawn with six formal beds which have been informally planted in pastel shades. 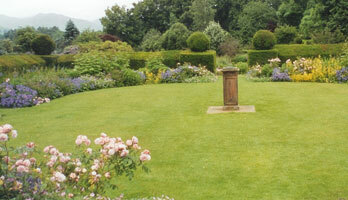 Below this, the Rose Garden has twelve geometric beds where the roses have been underplanted with cottage garden plants. The Long Border above the Rose Garden is planted with tall structural plants in shades of red, orange and yellow. 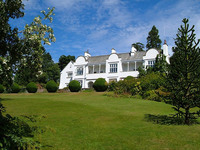 Below the croquet lawn, the lower lawns have groups of mature Rhododendrons and Acers. Access to the Lake shore is across parkland which has mature oak and cedar trees. Behind the formal gardens is a stretch of woodland which is edged with plantings of Pieris, Azalea, Rhododendron, Buddleja and Laburnum. In early spring the woodland bank is a carpet of snowdrops. Later many varieties of daffodils edge the drive and are in the woodland and borders. Hellebores, Primroses, Doronicums and Candelabra Primulas add to the colours of the various species of Rhododendron in flower. In summer, the “cottage garden” planting around the roses includes many species of Hardy Geraniums, Camassia, Smilacina, Iris species, Alchemilla, Mimulus and Leucanthemum. Summer flowering shrubs include Cistus, Lavetera and Abutilon. In Autumn the “hot” colours of the Long Border are at their best. Various Ligularias, Crocosmias, Euphorbias, Lysimachias, Helianthus and Inulas combine to produce a very colourful border. In late Autumn, the mature trees in the parkland produce spectacular autumn colour. In Winter the structure of the garden shows up, with the yew hedges looking dramatic with frost or snow on them.Gardens to visit while staying at Rampsbeck Country House Hotel include Dalemain Garden (3 miles), Hutton-in-the-Forest (11 miles) and Acorn Bank Garden (12 miles).